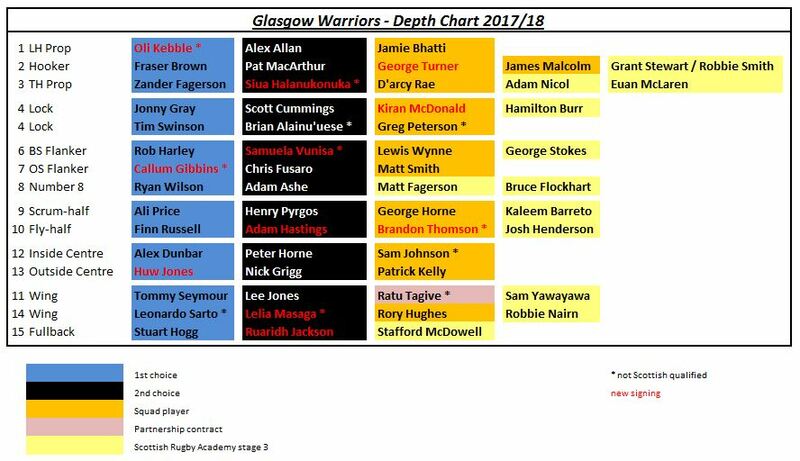 With less than a week to go until the season starts it’s time for a first look at the ‘Official’ On Top Of The Moon Depth Chart for 2017/18. There may still be some additions to make to the squad with Dave Rennie quoted as looking for a ‘couple’ more signings and the status still to be confirmed in relation to Richie Vernon and Academy scrum half Charlie Shiel (who is nominally attached to Edinburgh but who turned out for Glasgow in the friendly against Northampton). For a look at last campaign’s Depth Chart click here. There are currently 43 full-time pros confirmed for this year’s squad (plus 1 Partnership player and 13 SRA stage 3). That compares to 45 + 1 + 11 that the club started last season with. 3 players arrived after the 2016/17 campaign kicked off (Langilangi Haupeakui, Brian Alainu’uese and Ratu Tagive); Ruaridh Mackenzie joined on a Partnership contract; Lewis Wynne and Matt Smith signed pro contracts; and Brandon Thomson joined on a short-term loan. Langilangi Haupeakui, Ryan Grant, Jarrod Firth and Rory Clegg all left the club midway through the campaign. Overall the Warriors’ full-time squad averaged 47 players last season. The squad is getting younger with the average now standing at 25.6 compared to 26.6 last year. The average for the first team is 26.2 v 26.5. There are only 4 players over the age of 30 at the start of the season with nobody older than 31. That’s down from 8 last year which included Sean Lamont and Corey Flynn who both turned 36 midway through the campaign. Lewis Wynne and Scott Cummings (20 years and 9 months) are the youngest players in the full-time squad with Scott being the most junior member of the group having been born 6 days after Lewis. There are 27 capped players (22 Scots and 5 others) with 449 Test caps among them. The players have a total of 1,970 Warriors appearances behind them. They include 9 Warrior Centurions who account for more than half (1,124) of the previous matches played for the club. Rob Harley has the most Glasgow matches under his belt – 163. This season could see Big Bad Bob overtake Graeme Morrison’s club record of 177 games. 21 (compared to 16 last year) of the main squad have progressed directly from the Scottish Rugby Academy or its predecessor, Elite Development Player contracts (49% of current full-time players – 33% last season). and there were 6 ‘others’ (Moseley, Loughborough, Heriots, Waikato, Honda Heat and Hull). 6 of the players included above were involved in the EDP or SRA systems at some stage in their career. Look out for some analysis of the players over the next week or so. OTOTM will be picking out one individual from each level of the squad (1st choice, 2nd choice, backup and SRA) for whom 2017/18 is likely to be a big season. Nice article. Although, Brandon Thomson is SQ as his father is Scottish. Richie Vernon was included in the pro-draft, so must still be with the warriors.